You can change your password by entering both your old password and your desired new password. You can change your email by entering both your old email and your desired new email. You will then receive a verification code at both email addresses which you have to enter in the respective fields in order to complete the change. If you want to cancel the progress, click the red X. When transferring ownership of an account, it is recommended you change the email. 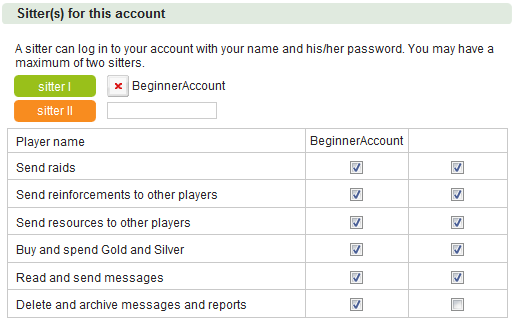 Here you can set up to two other accounts who can log on to your account in order to cover periods of absence. 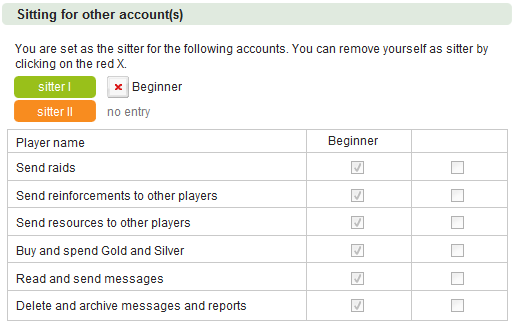 You can also see which accounts have set you as their sitter. Buy and spend Gold as well as exchange Silver. Please take good care if you grant your sitter the right to spend your gold. There will be no compensation from us if your sitter goes mental and spends all your gold to get 100000 days of +25% boost to Iron production or something. Tear down buildings in the main building. You are set as the sitter for the accounts named here. You can remove yourself as sitter by clicking on the . Furthermore you are able to see which rights you have on the accounts you sit for. If you wish to delete your account, you must select the "Yes" option, as well as enter your password to confirm. A 72 hour countdown will begin. Please be aware that a deleted account cannot be restored.